I’ve been struggling with finding the right words to use to write about completing my biggest running accomplishment thus far… a half marathon. This post was written over several sittings and even after having finished my SECOND half marathon. I’m not sure I ever could’ve pictured myself running 13.1 miles but I did. Thinking back, I’m not exactly sure how I even got to that point, to be honest. I know that it began when I printed out a schedule for half marathon training and then just kinda started following it and running. It’s weird, looking back, how uneventful the process seems to have been yet how eventful it actually really was. This year’s Miami Turkey Trot was my first 10k race and I was happy with how I did, 56:48. It was also the first race I got to do with my brother which made it that much better. After the 10k, I just kinda kept running… And then randomly decided one Wednesday, in the middle of the work day, that I should leave early and try running the half marathon distance for the first time. So I did… And I ended up running 14 miles… And it sucked and it was absolutely glorious all at the same time. That day showed me that I had what it took to run that distance so all I had left to do was to get it done on race day. 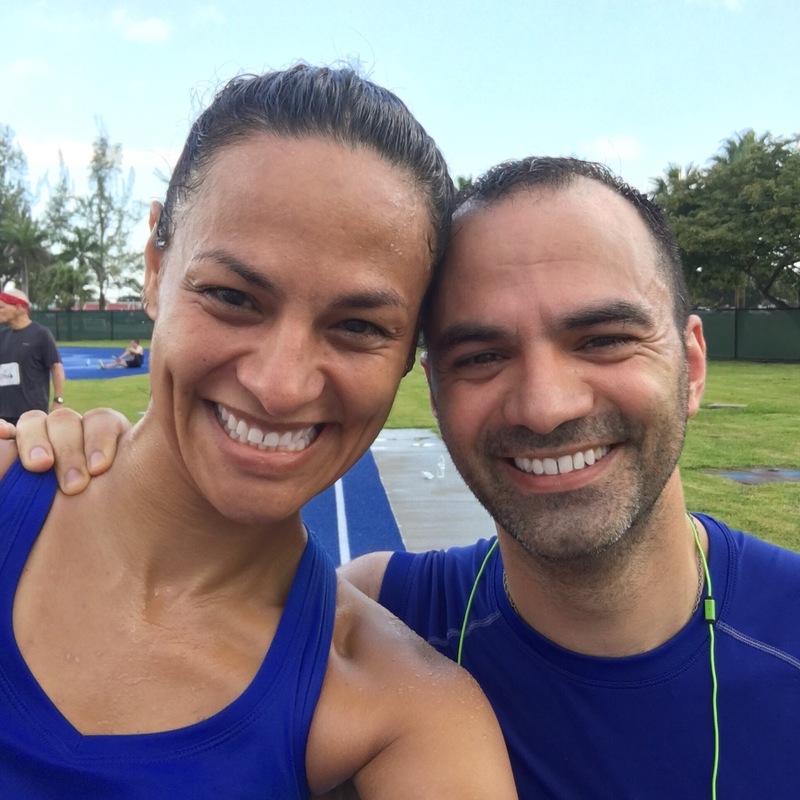 I had planned it all out, I had chosen my first half marathon based on where it was being held… In Miami, my hometown, the city that still owns my heart. It seemed only right that the place that held my heart should be the city that watched me achieve a huge step towards my bigger goal of becoming an Ironman. But Miami, in all its glorious unpredictability, had some tricks up its sleeve for my first half marathon. Race day was freezing, especially for a born and raised Floridian. I woke up at 230am on race day to find that the temperature was 50 degrees and dropping coupled with insane wind. I still thought I would be fine in a tank top and running shorts because I was sure that my body would warm up when I started running, boy was I mistaken. The race start temperature was in the low 40s and I had turned into an ice cube. Nothing I did while running managed to warm me up, yet I still ran. My hands burned from the cold, my feet were numb, my nose was bright red and a complete running faucet… and yet I ran. I ran and I kept running and I kept running. My headphones started REPEATEDLY warning me that they were about to die around mile 6 and then finally did die around mile 8 or 9. Now I was faced with only having my thoughts as a distraction for the toughest part of the race. Everything hurt. The joy that was the beginning of the race had faded long before my headphones did. I wanted to stop. To stop being cold. To stop the pain. To stop running. To stop the madness. Who’s damn idea was this anyways?? I ran up that last bridge, mile 10, pushing through pain and doubt (the only mile I dropped over 10 minutes at 10:08). I ran those last few miles with a hip that felt like it was going to give out at any minute. Despite the pain, despite the cold, despite the overwhelming exhaustion, my last 2 miles were two of my three fastest miles. I was able to overcome my most powerful enemy, my own mind. I crossed that finish line with my arms raised high, I felt like I was on top of the world. Every inch of my being wanted to breakdown and cry tears of joy. But I didn’t. I maintained my composure (mostly because I wasn’t sure I could stop and also because the lady next to me was crying and, boy, was it not very cute). Truth be told, I was a damn Popsicle when I finished even having to go as far as to ask a volunteer to open my water because my fingers were so frozen and numb that they couldn’t bend. It took me a good 3 hours to finally warm up, but it was still one of the greatest moments of my life to date. I am so proud of my time and what I accomplished that day. I finished my first half marathon in 2:08:23, a PR for me. and my second half marathon four weeks after my first finishing with a new PR of 2:04:09 (both in my current hometown of Gainesville). I can feel myself getting better and my time improvements mirror that feeling. I have a feeling that this new version of me is going to come in handy when I venture to that Ironman 70.3 start line on April 10, 2016 and even more so in that full Ironman I’m planning to do in 2017.